We recently sat down with one of our students, Manar Alhazmi, who is currently completing the elementary level of VIU’s ESL program. Her talent, determination, and personal story have made her family, teachers, and peers admire her, and I was eager to meet her myself. As a genuinely open person, Manar is strong enough to share her life with us, and she hopes that her story will inspire and motivate others. It’s not Manar’s first time in America; in fact, when she was seven, her family lived in Los Angeles for nine months. By the time she went home to Saudi Arabia, Manar had already fallen in love with America, its people and environment. Her favorite aspect is everyone’s friendly smiles and greetings. Manar is now back with a big vision: to improve her English and earn her MBA degree in Healthcare Management. Manar’s longtime dream has been to become a hospital manager, and she continues to overcome many obstacles to reach it. At the age of 10, Manar suffered from a serious illness and fell into a coma, staying in a hospital for many months. Although Manar’s loved ones were next to her and she had excellent medical care, she was still shocked at the sudden change in her life. 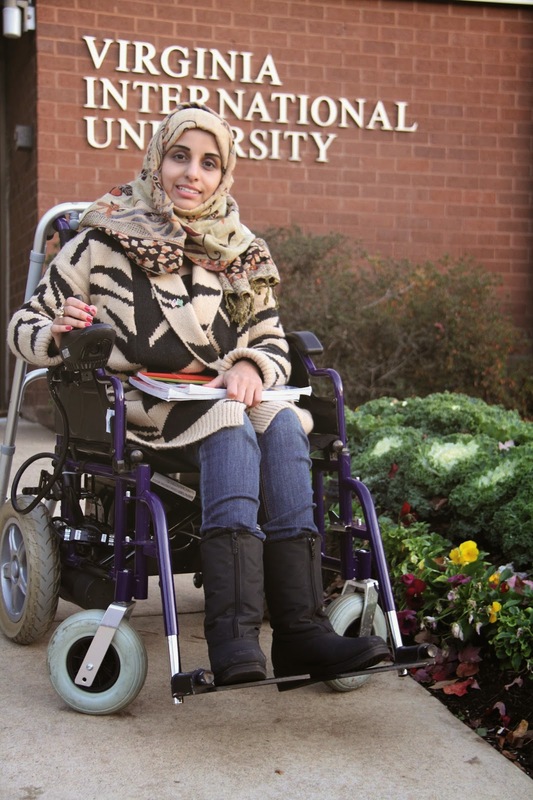 Because she could no longer take care of herself, Manar started to give up hope of ever being a “normal” person able to walk, run, work or even hang out with friends. I was curious as to her turning point and how she came from that low point at the hospital to being a healthy, energetic student in America. Manar credits her parents with her incredible improvement, and her “second chance at life.” When Manar was in the coma, “it was a very rough time for [her] parents to see [her] staying in bed day and night.” After six months, Manar finally left the hospital to continue her treatments at home. Her parents encouraged her to continue her exercises and her dad demanded that she continue her studies and stay strong, to “battle the disease in order to become a healthy and successful girl.” Manar completed high school and received her Bachelor’s degree from a university in Saudi Arabia. “Now I can do everything with my walker and my wheelchair,” she says. “I am always thankful to my parents for holding my hand and teaching me to fight for life. Without them, I would not be here today.” Her eyes turn tearful when she talks about her mother, Hanan Al Ahmadi and her father, Faisal Al Hazmi, a policeman who works tirelessly for his family of seven. And you will, Manar. With hard work, an excellent education and a great support system anyone can succeed! « What Makes a Good Writer?